My first photos are from a german town guard (milicia). The officer is the only person with symbols of his rank. The orange sash has nothing to do with dutch Service. I saw an orange sash and cocade on a painting of a german captain of the town guard of Schwäbisch Hall. Weapons and clothes are typical for citizens of a town. Farmers had normal round hats and somehow simpler coats. The old bayonet of one of the civilians is a reminder of the historical aspect, that every citizen had to buy his own weapons. Perhaps this poor fellow uses only the weapons and equipment of his father. In some rare situations such guards fought against regular troops especialy in sieges or as guards of earthworks blockading a road. As defenders of towns these milicias were not always useless. I particularly like the look of the chap in light blue. Thanks for you comment, leman. Now my first small Company of militia is ready. Unfortunately you cannot see the details like buttonholes etc. on the photos. We need a better camera. Really like their irregular look and mix of poses. Very effective indeed. The next Boy. This is Leopold. He was a musician, but now the town and country call everybody to arms. 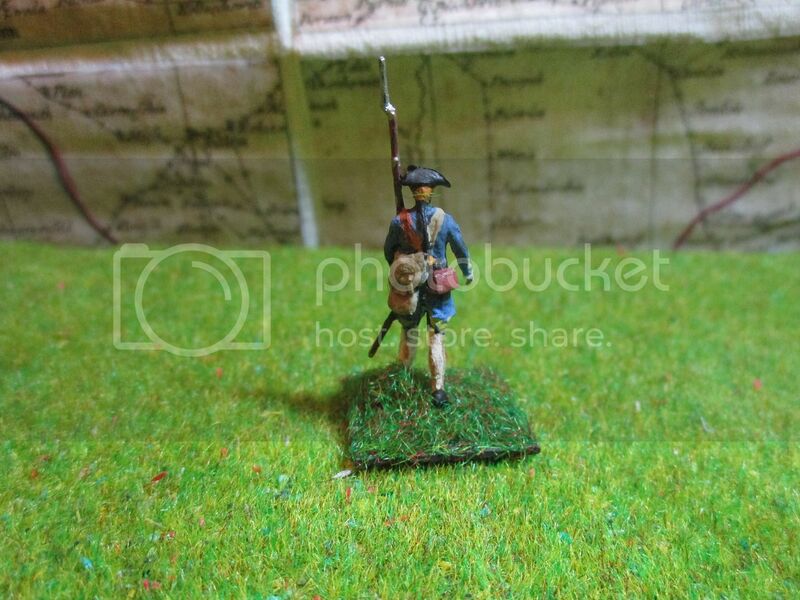 My first hanoverian unit is Regiment Bremer (1743)/Dachhausen (1745)/ Pöllnitz (1748). As you maybe see, I didn't managed to paint all these details of the saddlecloth. 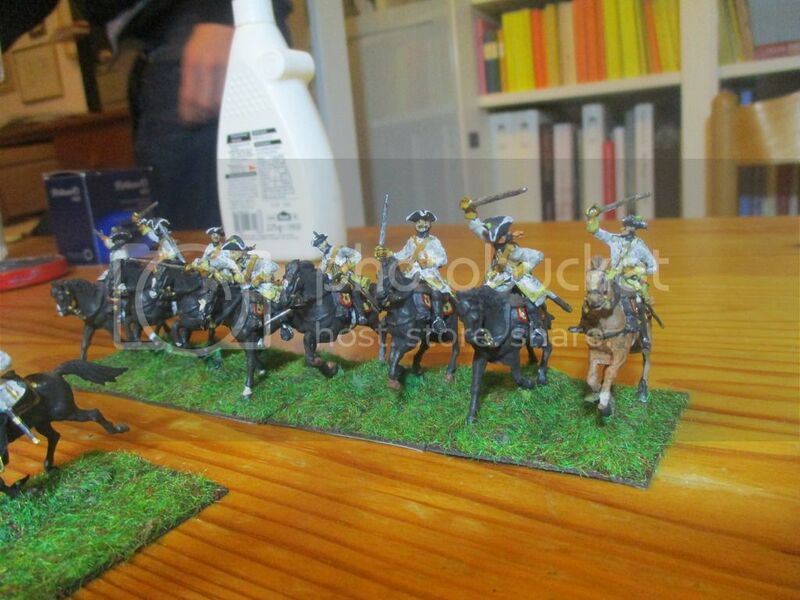 The Regiment get no flag because I want to use the unit as a somehow generic horse unit for other minor powers too. Lovely work! I like your little story about Leopold too! 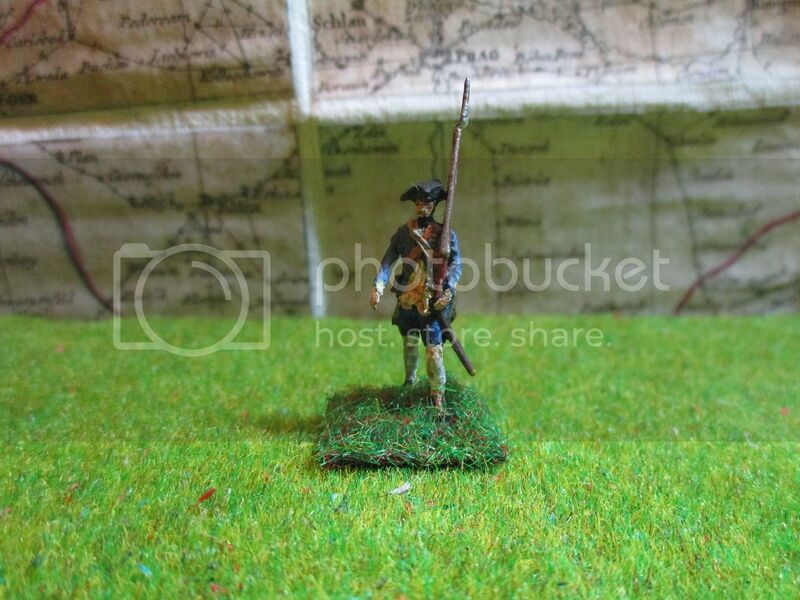 Now it's time for more hanoverians. The crew have the M1729 uniform. Blue breeches, waistcoat and coat, red lapels and cuffs, black bandeliers. 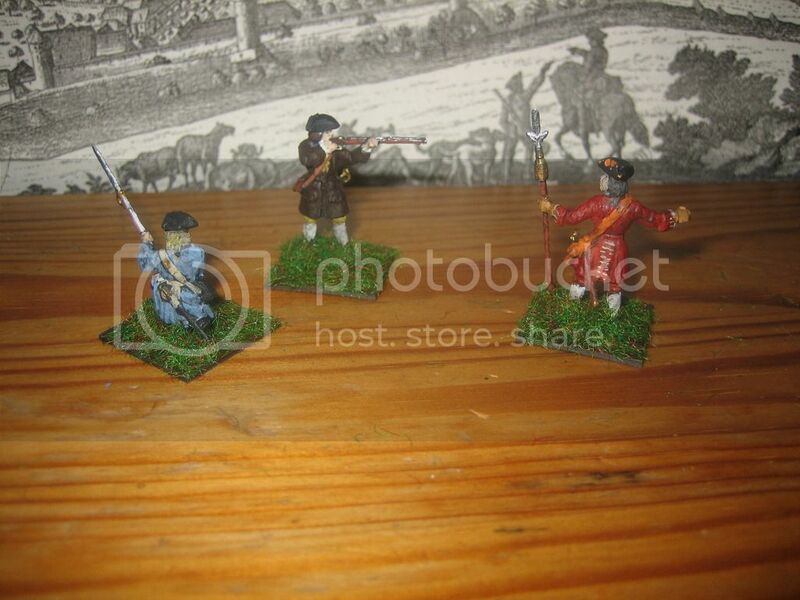 Figures and gun are from Revell (austrian artillery of the syw and gun of the imperial artillery 30 years war). 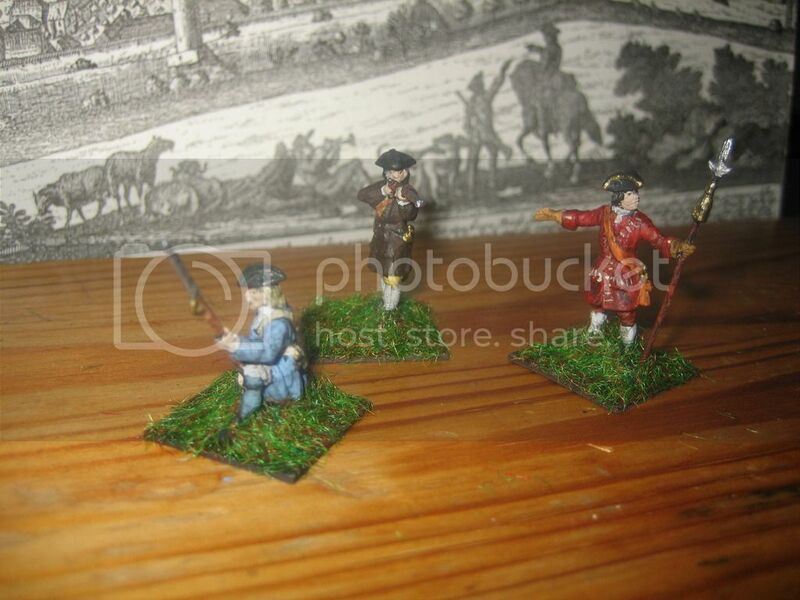 New troops for the elector of Hanover. Alt-Zastrow Infantry, this time a unit of 7 bases. 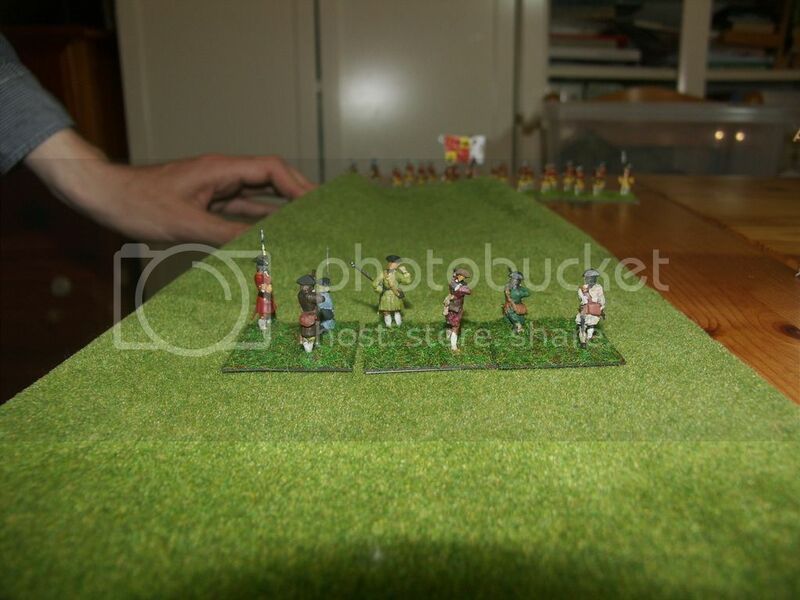 You can see the grenadiers on one wing. The normal musketeers I used are not so well. 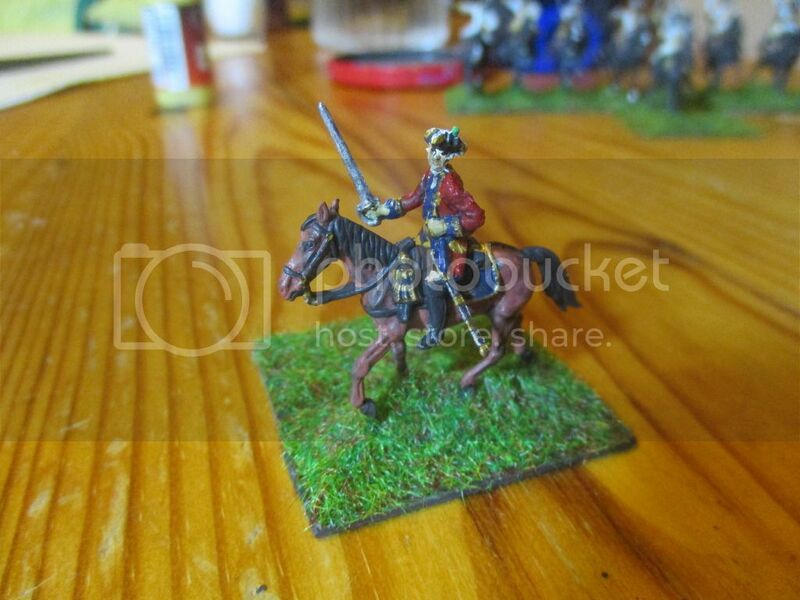 But the officers and Grenadiers are really nice sculpts. I painted flags for the first time. And I did it only because I saw no chance to glue paperflags on the poles. 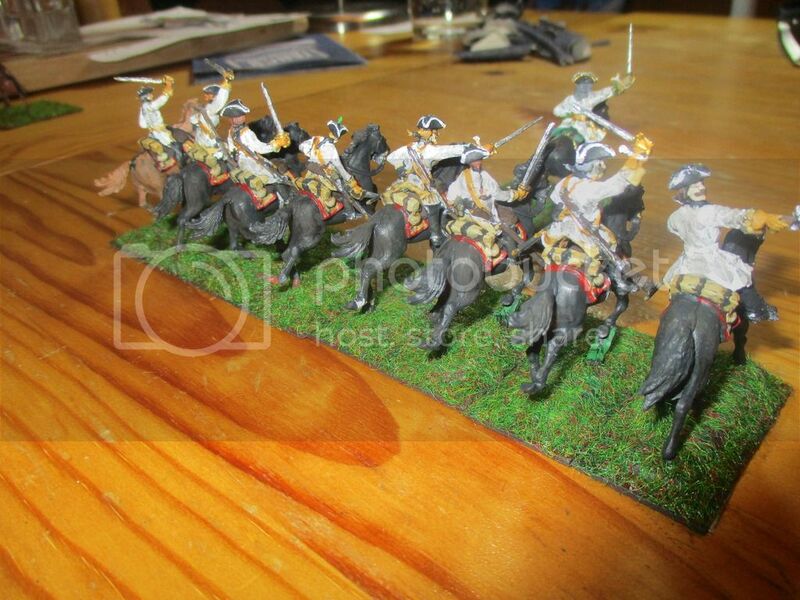 That Hanoverian command stand is beautifully painted and animated. General von Hammerstein leading the Regiment Leib-Reuter. I gave the Regiment black horses because the horse on the painting by Morier is black. Perhaps it was the typical colour of all the horses of this unit. Every rider has a different charging pose. I think that this was often the case in action. 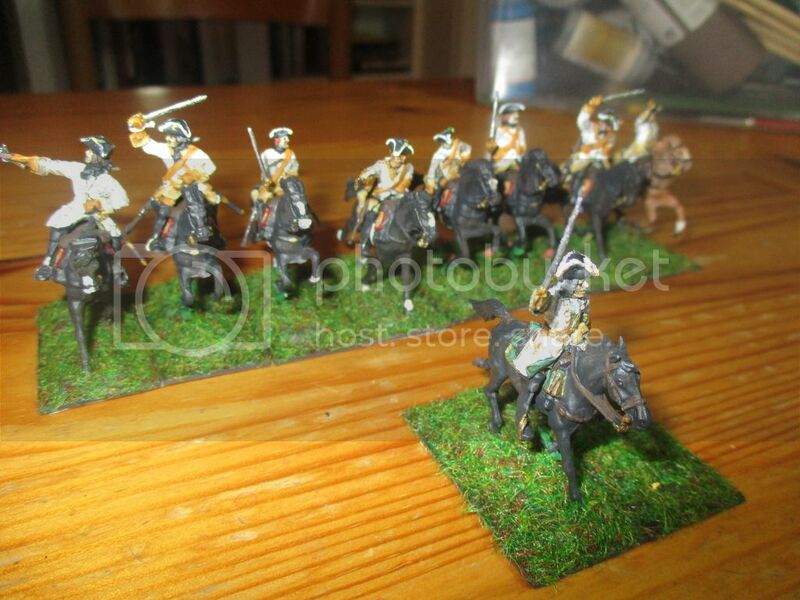 The horses are from the famous old set by Revell of austrian dragoons which is perfect for hanoverian horses. The commanding officer has a bay horse, the NCO has no carbine as noted on kronoskaf. 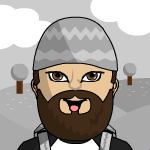 This is the commander of my infantry brigade. I've to say that I have no Information about the look of these generals during the WAS because all paintings I know are later. Still 2 more bn.s to paint. Hope you like the units and generals. Regiment Schulenburg (how it was named at Dettingen) or later Oberg.